Students also learn basic techniques for accompaniment and how to transpose songs into their key for singing. 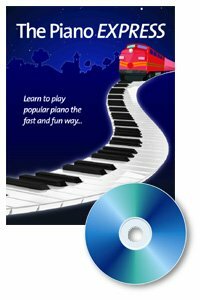 All chords are diagrammed on a keyboard "map" for ease in learning them. Every song and technique is demonstrated slowly and clearly on the accompanying CD. **Stop buying costly arrangements! Develop your own! It's a much more creative approach to playing the piano! You design how you want to play a song. This program shows you how. **Transpose any song into your key. Many people don't realize how easy this is to do and how much of a difference it can make when you are playing with others. **Easy trick for figuring out what "key" you are playing in. Then learn the predictable chords that will go with that key. This really accelerates how fast you can learn a song. **Techniques for reading a melody line easily with your right hand (even if you don't know all of the notes yet). Focus on the intervals and what that means to your right hand piano playing.